The cute, clever game was created by a West Seattle 9-year-old and her dad. Do you have any fainting goats? Goatfish! Goatfish is a brand-new card game created by a West Seattle 9-year-old and her dad that just launched in July. Created by Chad and Lillian Gray, the game is a clever riff on the classic Go Fish, with action and defense cards to up the ante and keep older players (and parents) engaged. 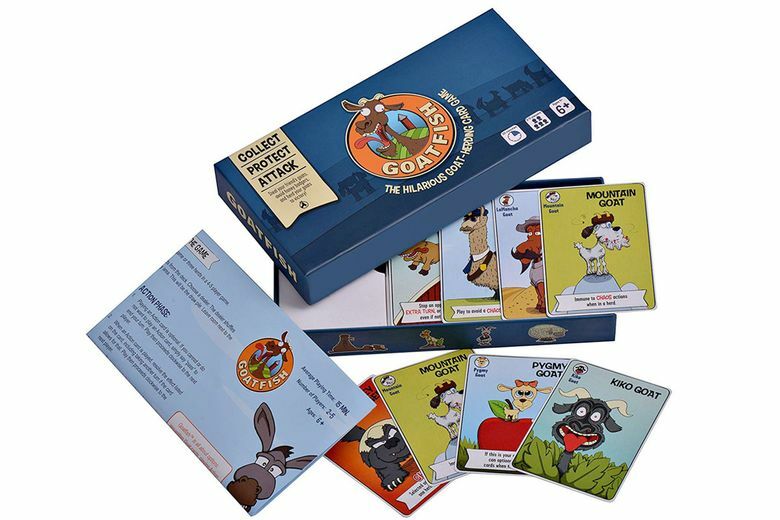 Win by being the first to collect goat herds, getting matches from other players or drawing from the pile (as in traditional Go Fish). But as the game progresses, the action and defense cards come into play — herds can even meet up with a hungry honey badger! Funny illustrations by Hank Baarslag include goats in lederhosen and with mustaches, as well as a security llama. A card requiring your best impression of a screaming goat keeps everyone laughing. It’s about 15 minutes of family fun for 2–5 players, ages 6 and up.